DESCRIPTION Bright and spacious townhome located in the very convenient community of Shaganappi! Short walk to the C-Train station with wonderful amenities at your finger tips, this unit is a must see. The open concept main floor on this home is perfect for entertaining with a central kitchen complete with stainless steel appliances, ample cabinetry and plenty of counter space. Large area for a dining table to host family gatherings and a south facing balcony to enjoy the sunshine. Spacious living area with room for a sectional and a corner gas fireplace to cozy up during the winter. Half bath also on the main. Upstairs you will find a huge master bedroom with cheater 5-piece ensuite, another large bedroom and insuite laundry. This unit comes with single detached garage to park your vehicle which provides additional storage space. The complex offers a giant rooftop balcony in the back to host larger groups and soak up the sun. Don't miss this one! Home for sale at #104 2718 17 AV Sw Calgary, Alberts T3E 0A7. 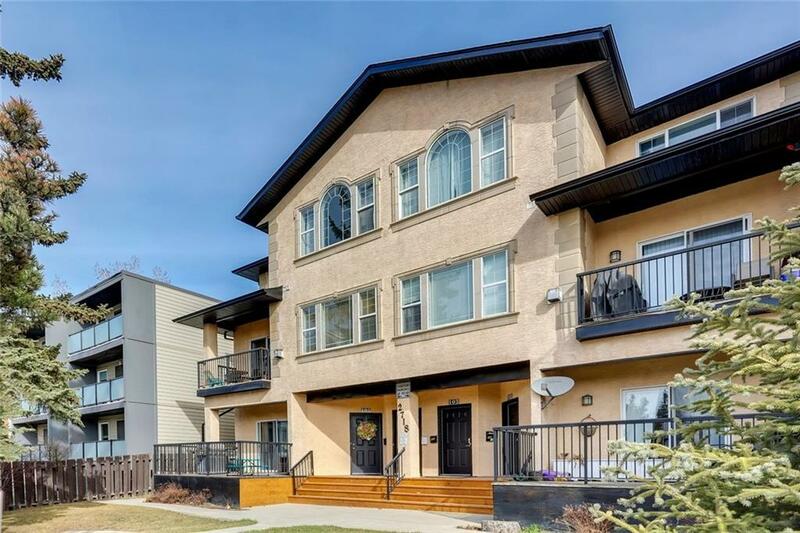 Description: The home at #104 2718 17 AV Sw Calgary, Alberta T3E 0A7 with the MLS® Number C4239148 is currently listed at $289,900.